Catch The Window! : Play Time! Here is the baby quilt for our little one on the way! This is what I wanted to play with on my weekend of solitude, but had to wait until the Stars quilt was finished. The pattern is entirely out of the imaginings of my fevered brain. That also means that there was no pattern to work with, so it has taken a bit longer to finish than I had anticipated. Due to the children being around while I've created, I have had to get peanut butter and chocolate pudding washed out of it already. I tried to come up with something that was particularly "boy-ish". 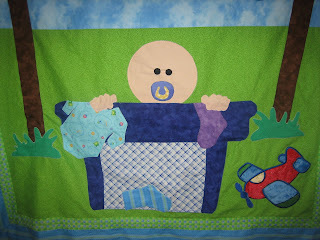 After searching through all of my patterns, and everything under "baby boy quilt" online, it seems like the most boy-ish quilt available out there was either a blue & white pattern, or involved a bear, or Noah's Arc. That doesn't seem right. Or very realistic. So, I put my own brain on "search", and thought about what it is that a boy does that I thought would be great in a quilt. Kites would be fun, or balloons with fun fabrics - just SOMETHING that says boy, and not "Little Lord Fauntleroy" sissy-ish style. Then, watching my kids, it hit me. I realized that they both seem to love to get in the laundry basket - whether or not there is clean laundry in there, and just hang out there. So this idea was born. As with any other project, it has gone through a number of incarnations. I have yet to add a hair swirl (the first one I did, ummmm, REALLY didn't work out), and some clothes pins - but my iron broke today - of course! "What are those big brown things right there?" -You serious? Those are posts for the clothes line. "They're a little thick, maybe some grass at the bottom would help it look better - or at least give you the idea that they're in the grass, and not just sitting on top there." "Why is the baby's mouth open?" -It's not OPEN, can't you tell that its a pacifier?! Kids don't have purple mouths! "Oh, maybe if you made a little handle thingie, it would look more like a pacifier." "What is the baby sitting in?" And so, just in case you can't tell, those brown things with the string is a clothes line, and the white "thingie" on the line is a cloth diaper drying on the line. 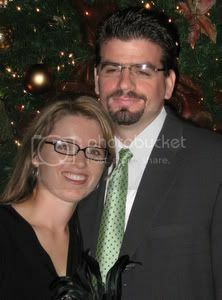 Or as Matthew guessed, "a white, baby, . . . something???" It'll be fun to see what my quilter does with this one, and I believe that this baby will be the first of my babies to have a quilt done - by me, before s/he showed up. But, after two kids, I've also gotten smart enough to understand that it's harder to get one done after they come than before. So, TA DAH! Two quilts in about a week. Not bad, not bad. I LOOOOOVE this quilt! You, my dear, are a creative GENIUS! 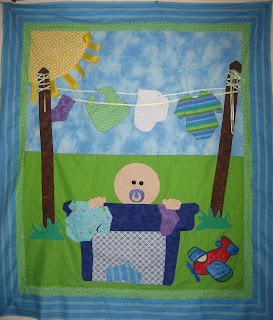 Love the colors, the idea, the bald baby with the paci, the clothesline....love it ALL! My favorite....the stripey onesie hanging on the line, but you know I'm a sucker for little boys in stripes! I swear you should sell this pattern! Katrina - -your quilt is AWESOME!!! Thanks for posting all your adventures on this blog. I love checking in on it often! I agree with Lisa - -you should sell this pattern!!! It is not very often I see a boy quilt that I like as much as this one. I think it is cool. My kid will be lucky if her room will be painted by then...I started painting when I thought I was getting better and wham-O - I have had a partially painted room for over a week! You are quite talented. As for the curl of hair, it kinda screams that it needs some sort of Peanuts-esque type hair - a few strands. Is that OK to say to the Pickles family? The commentary between you and Matthew made me laugh. He's definitely more quilt-appreciative than most men and despite being an attorney he has quite the creative side to him. I think his suggestions were brilliant although I understand the frustration of a project you just want to be DONE as well and pregnancy crankiness.